December | 2016 | Life, She Wrote. Well it’s official, there’s only four days left until Christmas brightly jingles itself onto our doorsteps. And I’m totally freaking out. This year, I’m hosting for the first time given that I now have a house big enough to do so. And I have been so excited to don the Christmas apron and test out my roasting-things-in-the-oven abilities. Because in theory, it should be fairly easy right? Buy the food, hang the fairy lights, drink and be merry? Oh no. As it would turn out, hosting Christmas is a far bigger task than I ever expected. Cue outburst along the lines of… how on earth does Mum do this every year?! Consider me well and truly overwhelmed. I have a to-do list that would rival the height and weight of the Taj Mahal. It includes making garlands, and downloading instructions on how to season chicken amongst other ridiculous tasks that really were only ever meant to be ‘Mum-doing’ things. It seems like every time I think that I have perhaps thought of it all, you bet your rudolf red nose that I’ll find something else to add to the ever-growing, never ending list. 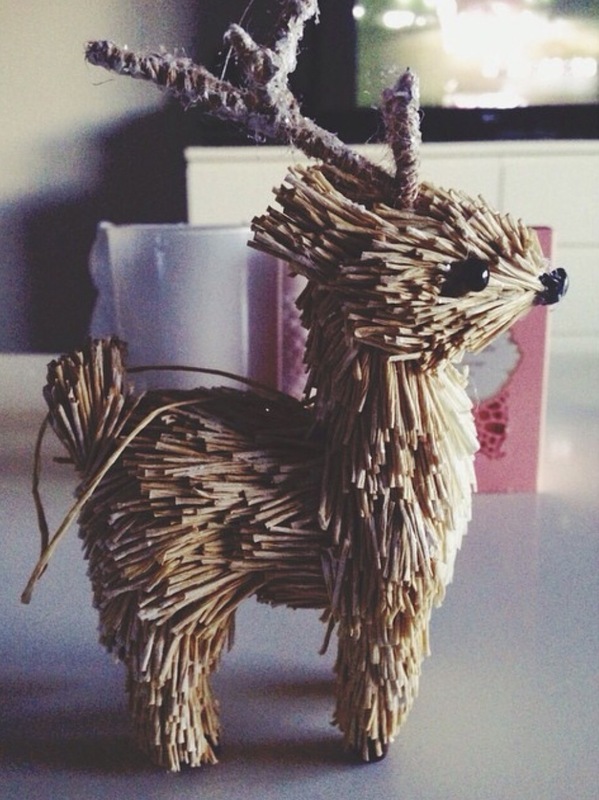 Between making toothpick reindeers for decorations (seriously did not make it easy for myself…remind me to delete Pinterest account once I’m done here), I have been asking myself at least 20 times a day this week, why I ever thought hosting Christmas was a good idea. Mum had a good thing going for the last 23 years, and I’m now entirely sure we should have let her go for her 24th. Realising six days out that I simply did not have enough dining plates was scary, remembering five days out that I just might need placemats to go under said dining plates made me really question my future-housewife potential. And the food! Don’t even get me started. With the amount of money I’ve spent on food for one day in December, it’s looking like porridge may well be what I survive on come 2017. It’s made me suddenly feel very grateful for the many Christmas’s before where people have fed me without charge…because I will admit I’ve contemplated portioning salted peanuts to two per person. However with all that being said, I am choosing to cut myself a little slack. It is my very first time hosting Christmas, and while I’m entirely sure it will not find itself even remotely close to being in the same proximity to my Mother’s Christmas Extravaganzas – I’m sure that it will be one to remember because it was my own. After all, I don’t think that it really matters how much food there is, or whether we eat off proper plates or paper ones. It really won’t matter if it doesn’t turn out as planned or if the peanuts all get eaten. Because I think what really counts is being with the ones you love to celebrate Christmas (and the all-too-time-consuming toothpick reindeers, of course). It’s about cherishing each other and watching the fairy lights sparkle knowing that you have been so lucky to be sharing such a special day with the people who make your entire world light up. It’s listening to Michael Buble belt out famous Christmas carols and laughing at Grandad who had a little to much brandy with his Christmas cake and decided to sing-along into the end of a bonbon cracker. It’s about reading aloud awful Christmas jokes, and shouting the punch lines in perfect harmony because this isn’t the first time you’ve been asked what a reindeer without eyes is called. It’s about having the pavlova, rocky-road and the fruitcake because losing weight is next weeks problem. It’s finding time to smile and be thankful for the messy kitchen, the stained tablecloth and the trail of Christmas wrapping paper that now embellishes your house, because they are the telltale signs of a Christmas well-enjoyed. But I think most importantly, it’s about letting the happiness fill your heart to the brim, and feeling the warmth envelop your chest as if it might explode. I hope that each and every one of you have a really wonderful Christmas this year, and find the happiness I know your heart deserves to feel.